This year’s Passover is now complete, so please save this song for next year’s festival! 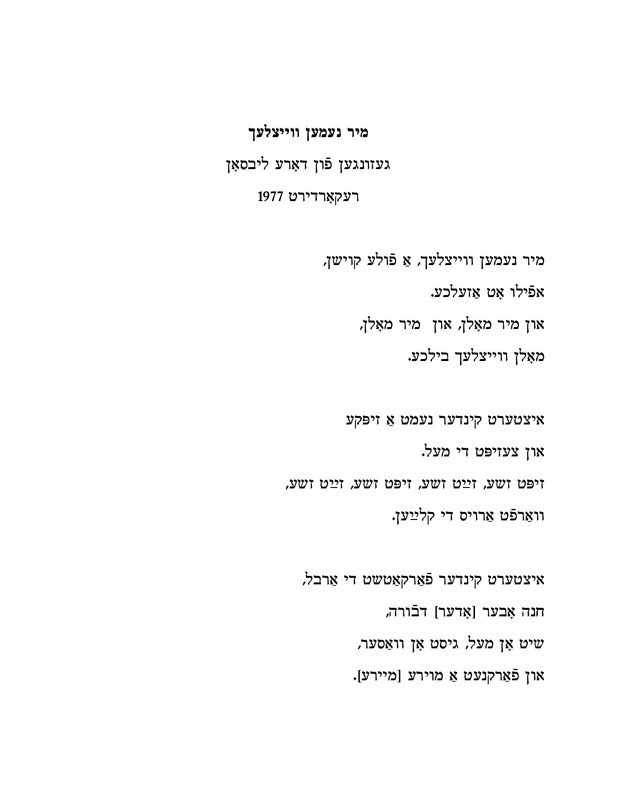 Mentshn getraye: a matse-podriad lid is the second matse-baking song we have posted on Yiddish Song of the Week. The first was “Mir nemen veytslekh”, sung by Dora Libson. 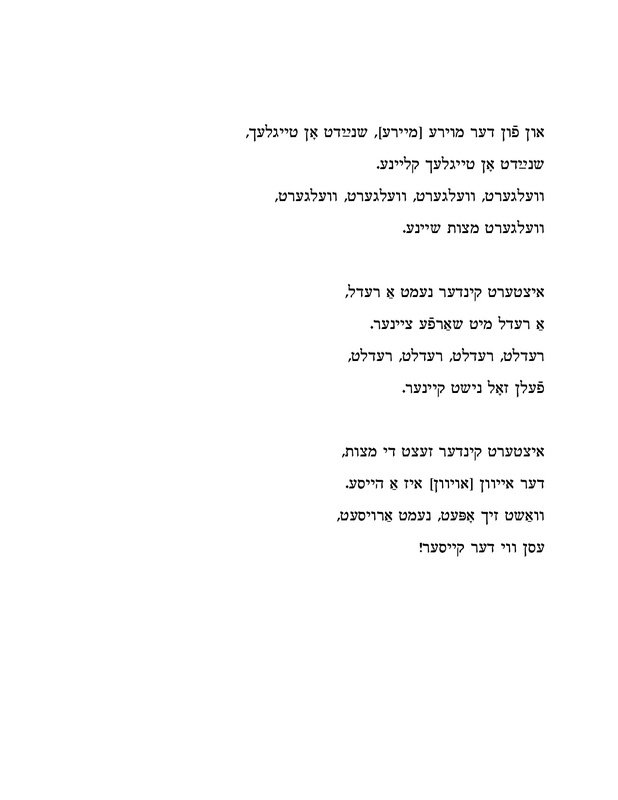 Mentshn getraye was recorded from Jacob Gorelik by Michael Alpert and me in New York City in 1984, and Alpert later recorded his own performance of the song on the Lori Cahan-Simon Ensemble’s CD Songs My Bubbe Should Have Taught Me: Volume One: Passover. Jacob Gorelik introduces the song with these words: “…the second song I heard in my town. My mother and other mothers sang it. It was called the “Matse-podriad-lid”. In town there was a custom, that once a year when Passover came, money was collected especially for poor people who could not buy matse, could not buy wine. Help! No way to celebrate Passover. It [custom] was called moes-khitin. That was one thing. The second thing was – the matse was the primary thing. So the whole town got together and there was complete unity – the orthodox, the “modern” ones, the Zionists, Bundists, socialists. They used to rent a house with an oven, and buy wood, buy flour and hire people to bake the matse. And this was called a community “matea bakery” by the entire Jewish community. And as someone once asked – when you sing, or you do something good – do you do it for youself or for the other person? It was a combination. One had it mind that you were doing it for the poor. You were baking matse for them. But at the same time, at that time it was a joy in town becasue it was a boring life. It was also an opportunity for girls and boys to get together. And we used to sing and this is one of those songs that were sung. Who composed the song…This song is light verse. It’s not ‘pure’ poetry; but it’s humorously colored. According to what Mendel Elkin once told me the writer was Tunkel – or “The Tunkeler” [The dark one] his pseudonym. Bay vemen es iz nor tsayt faran. bikhelekh nor trogn ir kent. dem tam fun mazolyes af di hent. Kosher un erlekh un fayn. Spoken: A freylekhn Peysekh! Flegt men zogn alemen. Dear people, those who are busy, and those who are free. Whoever has some time to spare. for the man in need. who only could carry books. the taste of calluses on your hands. Spoken: “Happy Passover!” Is what we wished everyone. Though Gorelick was from Byelorussia, the song text is also found in the writings of Galician writer Soma Morgenstern, who quotes it in his book “The Third Pillar” (1955), page 59, translated from the German [see below]. I have yet to find this poem in Der Tunkeler’s writings.